Once your baby masters walking, it’s only a matter of time before he’s off and running! Let’s take a look at when and how running develops, and why it’s an invaluable skill. 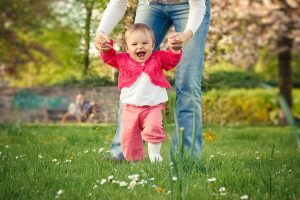 Running appears around 18 months, although the range for this milestone is wide and depends on when a child starts walking. Running requires strength, balance and coordination, and 4-6 months of walking helps prepare your toddler’s body to run. By about 20 months, your little one awkwardly runs short distances. Because running requires a higher level of balance, he may fall frequently. Those falls can make a mama’s heart skip a beat, but he needs to practice running as often as possible in order to master it. With practice, around 22 months he can run in a straight line with more precise movements. By 24 months, he may begin to change direction while running, and develop the ability to run around objects in his path. It builds endurance. The American Heart Association recommends that by age 2 children should participate in at least 60 minutes of “enjoyable, moderate-intensity physical activity every day.” The World Health Organization says that by age 5, those 60 minutes should include vigorous activity as well. Your toddler needs endurance to keep up with those guidelines, and running is a surefire way to build it. Read more about how running is linked to lifelong fitness and health here. It strengthens bones. Bones develop and harden in response to stress. In this case “stress” is a good thing; when children run they put valuable stress on their bones, helping them grow and become strong. It strengthens muscles. Running strengthens muscles that are critical for all gross motor movement. It enhances motor planning. Motor planning allows us to safely navigate our environment. Running sharpens this skill because it requires children to quickly plan motor movements to avoid getting hurt. The more your toddler runs, the better he will be at assessing and adapting to different environments and terrain. It teaches movement control and regulation. Running teaches children to control and regulate their movements. For instance, a child learns to run with less intensity when she is running to hug her younger sibling than when she is running into the open arms of a parent. It supports social development. Young children love to run, and they incorporate it into their free play. Whether chasing each other, racing, or playing “Follow the Leader,” running motivates children to engage with each other. Among other social skills, running play teaches navigating group dynamics, negotiation, and turn-taking. Our BabySparks program offers several fun, motivating running activities you can do with your child. Try doing these activities on different surfaces (floor, grass, sand, etc.) to boost balance and coordination. Anytime it’s safe, let him run barefoot, which contributes to agility and healthy foot development. Above all, practice is key, so steel your heart for those falls and let him go, go, go!